DAY ONE: 10am private shuttle leaves SJO. DAY SEVEN: 9am private shuttle departs to SJO. The adventure is not over~ the journey home begins. Every day begins with fresh coffee, guided gentle yoga, and fresh fruit/smoothies. Meals are made fresh at the villa by holistic nutritionist, Sarah Philipp. We will provide regular yoga sessions in the evening. Rest is important, so we have created a rhythm in the itinerary that promotes movement and exploration as well as relaxation and reflection. We are functioning as a community on this adventure and respect the balance of social and quiet time that we all need. The villa has multiple spaces that one may use for socialization or retreat to quiet. There is a patio overlooking the rainforest, an open-air gazebo, yoga stage, living and dining areas, as well as a private path leads to the beach. 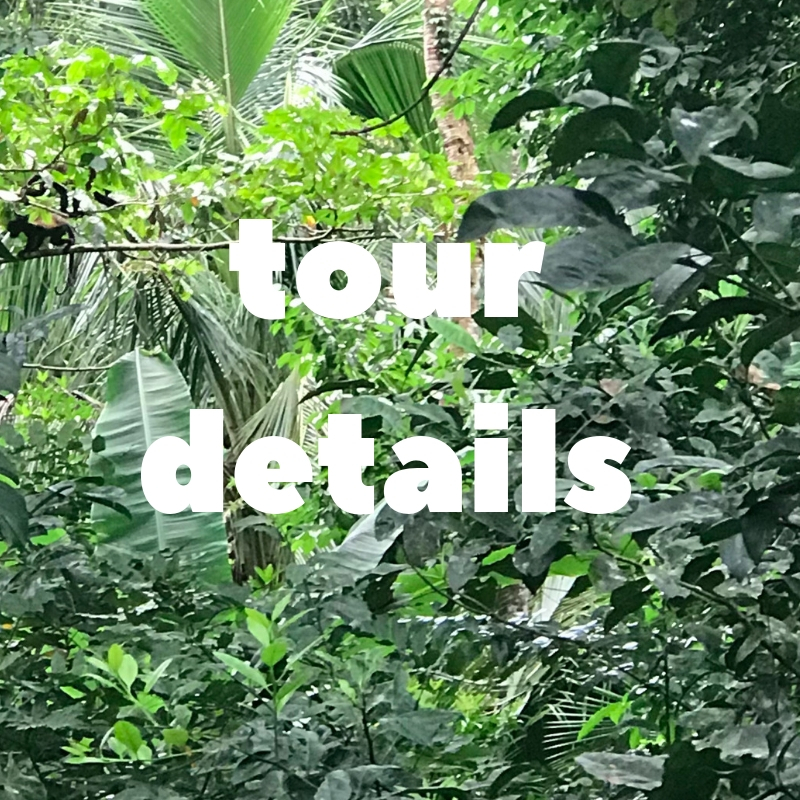 Board a private shuttle van in San Jose that will take you and other mke MindBody Wellness guests on a 5 hour drive through the heart of Costa Rica's incredible countryside. Take in the mountainous rainforest, rolling green pastures, colorful towns, and forested hillsides that make this country a diverse ecological gem. Welcome to our beautiful, exotic, private villa near the beach. Settle into your room, tour the grounds, and explore the beach. Upon arrival to our villa (Reloj de Arena), guests will be greeted by mke MindBody wellness hosts with a welcome dinner. We will go over the intentions for the week, house rules, and information about the area. Group dinner serving holistic, healthy Caribbean-inspired preparations of local foods. Receive a special gift from our wellness team that will assist you on this journey. Set the intention for the week and hold a discussion about why people came and what they are seeking. AFTER DINNER: Guided meditation, journaling, and light stretching- setting intentions for the week and grounding after a day of travel. Retreat to rest for the next day. REST IS IMPORTANT. We are not seeking to burn the candle to the bottom all in the first few days. Steady your energy and plan for a week of balance and alignment. The magic lies in the opportunity to explore and re-center. DAILY LIFE: The best laid plans are always changing! We have organized a loose structure for the week, but do not have a set schedule. Weather changes, time gets away from us, or one experience leads to another. We honor your freedom to explore and will guide the schedule based on the rhythm of the day. Ever wonder how chocolate is made? Our Chocolate Forest Experience is the best cacao farm and chocolate factory tour in Puerto Viejo, Limon, Costa Rica. Our chocolate tour is one of the best things to do in Puerto Viejo. Our owner/guide will teach you everything you need to know about cacao, chocolate history, tropical wildlife and of course chocolate making. We grow our own cacao and make the chocolate right here amongst the cacao trees. Search the world over, and you will not find a truly tree to bar chocolate tour. This is a walking/hiking tour which last 2.5 to 3 hours. Some physical exertion required, but guest in average physical condition have no problems. Total distance is 1.6 k or one mile. Elevation change about 60 mts or 200 ft. Fresh water is provided at half way point but personal water is recommended. Sturdy shoes are recommended but not required. Flip flops are fine if you like to walk in them. 6:30-7:30AM: Breakfast in the dining room. Coffee, smoothies, and fresh local foods. Breakfast will be offered more casually due to various departure times for tours. Some tours will require departure from the villa by 7am, and we can be flexible with this schedule once we have finalized everyone's itinerary for this day. Choose one of the following tours organized by local adventure companies. We will take care of shuttling guests to and from tour meeting destinations. These are free days to move with your own rhythm. We respect each individual's pace and welcome a day of rest or a day of exploring. Plan an adventure or chill at the beach. 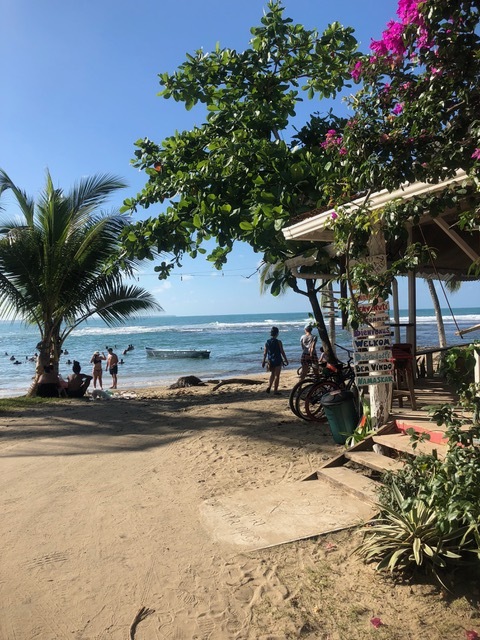 Punta Uva beach is one of the best in Costa Rica. We will also take interested individuals to rent bikes for the day. 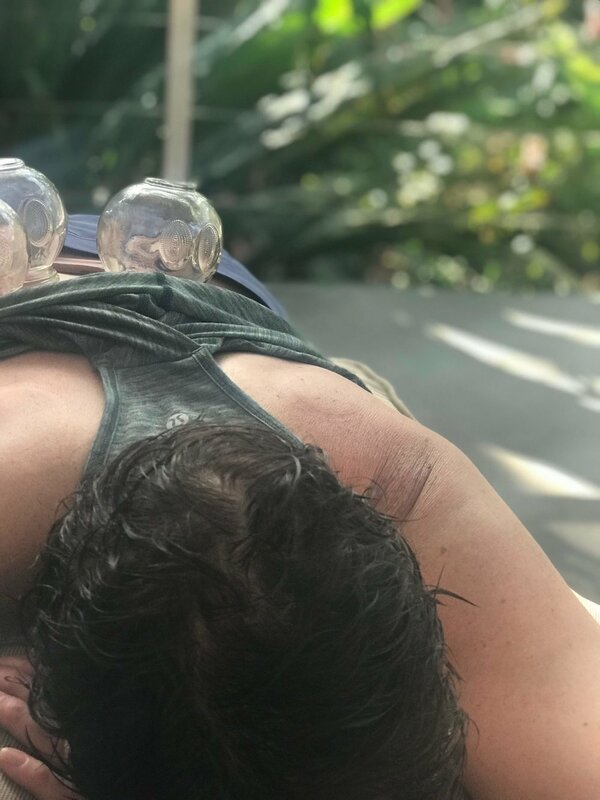 Unwind from an adventurous week with gentle cupping and a cooling jade roller facial. Chlorophyll is hydrating, soothing, and repairing for the skin. Resting with a chlorophyll paste applied to the face and neck will cool you down and treat minor sunburns. Our spa will be set up in the gazebo of our villa where you can make your way between exploring on bike, relaxing with a spa treatment, and unwinding on the beach. We are in the Caribbean- so we will follow suit and arrange for spa sessions in a casual manner. Spa sessions will be provided by Aleisha Anderson, licensed acupuncturist and retreat host. MINDFUL EATING CLASS: Time To Be Determined... We will include a mindful eating lesson at one of our meals. Mandalas are elaborate symmetrical designs used in many cultures to provide meditative space for intention setting and collective healing. 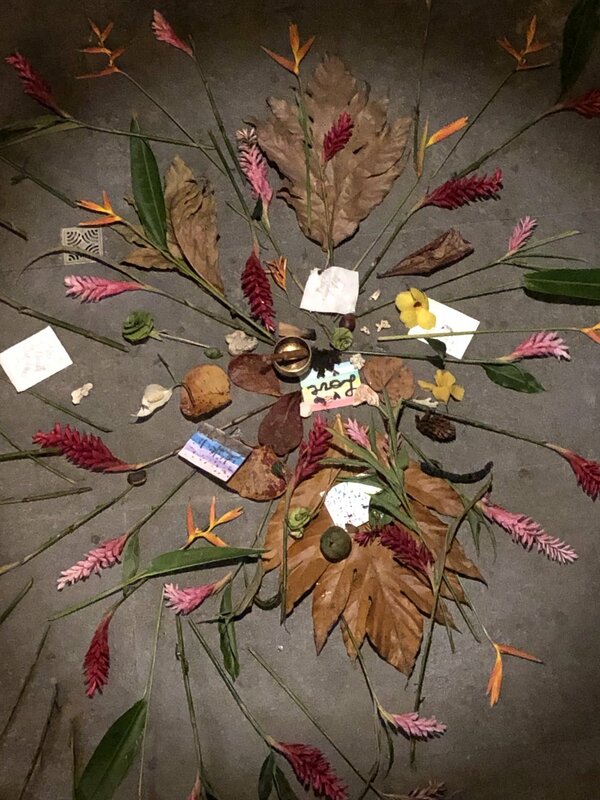 Build a group mandala with materials collected through out the week. Recall where items were collected, why you picked them up, and how they add to the story being created in this collective expression. Careful to place objects in patterns with respect to other people’s contributions. Upon completion, gather around in a seated circle with journals. Now we reflect through words or drawings…. Draw the mandala or write about what it may represent to you. Have you ever experienced something like this before? Is it difficult to know that this time is coming to an end? We are making this mandala to reflect on the week and also pause to really appreciate the experiences. This is an opportunity to stay in the moment- not mourning the end of this time and not worrying about the next day’s travel. This is an exercise in letting go and holding space together to honor this life changing experience. Have you gained a different perspective on daily living more simply? What "clutter" will you address when you return home? What aspects of this retreat can you bring home to your daily life? CLOSE THE EVENING BY SWEEPING UP THE MANDALA AND SHORT GRATITUDE MEDITATION BEFORE BED. HOW DOES THIS APPLY TO HOME LIFE? TUNE IN TO YOUR ENVIRONMENTS & HONOR THE EVERY DAY RITUALS THAT CREATE SUCCESS- NOT ONLY THE BIG EFFORTS.